We are sorry to say that Toroso is no longer in business. 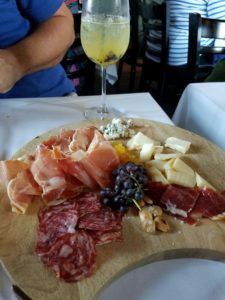 Try Old Vines Wine Bar. Tapas style with great cocktails, wines and beers! 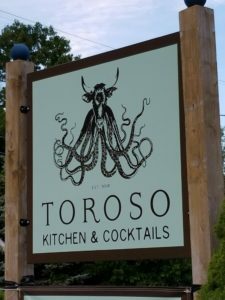 Chef Shannon Bard has recently opened Toroso a new tapas restaurant in Kennebunk. Her plans also include a cooking school, catering company and wedding venue. Shannon is a Kennebunkport resident who has been on the Portland restaurant scene for many years with her hugely successful Zapoteca restaurant (also closed down as of 2017). Just recently opened in the old Kennebooks building at 149 Portland Road in Kennebunk, this new adventure is a dream come true for her. We couldn’t wait to try it out so had dinner there on the fourth night that they were open. Shannon and her husband were both on hand and they looked tired, but happy to be up and running. The atmosphere is casual with a large dining space on one side of the restaurant and an open kitchen so you can watch the chefs at work. On the other side of the restaurant is the bar with seating at the counter and high top tables. Toroso offers a good wine selection and mixed cocktails and beers. If you are a sangria drinker, their white summer sangria is light and refreshing with hints of peach. We’ll try the red one next time. The menu offers a wide selection with something for everyone. The Charcuteria Y Queso includes Spanish cured meats and cheeses. Their Cabacero de Lomo Iberico, a cured top loin that is hand carved by Shannon herself, is not being served anywhere else in the USA. If you can’t decide which one or two meats and cheeses to go for, our recommendation would be to try the Tabla De Quesos Y Charcuteria which is the chefs selection served with honeycomb and pineapple jam. It was delicious. of choice on the menu. Choose from Cold Tapas,Vegetables and Salads or Hot Tapas that include seafood, vegetables (great for vegetarians), lamb and goats cheese. Our goal was to try a little of everything our first time there, but there was just too much that looked good, so we couldn’t manage that. We settled on our “one tapas” being the Caramelized Goat Cheese from the Hot Tapas section. The presentation was beautiful with a sherry reduction, raspberries and chopped pistachios. Lots of interesting flavors that worked really well together. Finally, they have a number of Larger Plates which is perfect on your own or to share. Again, there’s a nice mix of fish, non-meat, chicken, pork and beef to choose from. We had the Seared Angus Beef Strip which was served with fries, sea salt and what we would describe (sorry Shannon) as a fresh ‘tomato like’ salsa with some sea salt sprinkled around and large roasted peppers on top. I’m always wary of peppers, but these were mild and full of flavor. The meat was sliced and tender with a pink center. I want to try the other Large Plates next time, but it’s going to be hard to not get that beef again. Because it was only her fourth night being open, desserts were not on offer yet. Another reason to return soon! We’re anxiously awaiting the opening of the cooking school and catering company and will write more once that’s up and running and we’ve had a chance to try it out. If the restaurant is anything to go by, it will be something special for the Kennebunks, locals and visitors alike. Toroso plans to be open seven days a week, year around. They are a 10 minute drive from the Inn with plenty of parking on site. They are open for dinner during the 2016 summer season with plans to start lunch service at a later date. Reservations are recommended. Tell them the 1802 House sent you. Salud!